Few things have to say in advance. A vector can only be coordinated when there is a frame. A frame is a set of “reference” vectors, which span the whole space. Those reference vectors are called basis of a frame. a transformation is on a vector or its coordinate. And it can be represented by a matrix. A Matrix should act on a coordinate or basis, but not a vector. is the column vector of basis reference vector. is the coordinate column vector in basis. is the transformed vector in space. and are the matrix of transform. has the same meaning of , only the matrix representation of the transform is different due to different basis. This diagram can extend to any series of frame rotation. and the triangle just demonstrate how 2 steps frame transform can be reduced to the vector transform in same frame. 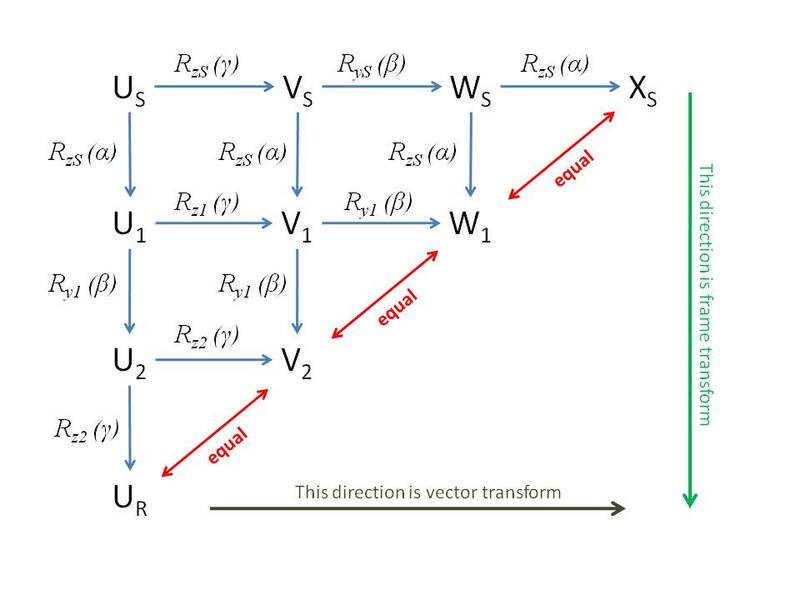 HERE is a note on vector transform and frame transform. with the help of the post changing frame, we are now good to use the Euler angle. for the rotating frame axis is rotating positive with the static frame. rotate on , the z-axis with , which is . the x-axis and the y-axis is now different, we notate this frame with a 1 .
rotate on , the y-axis in the 1- frame by angle , which is . 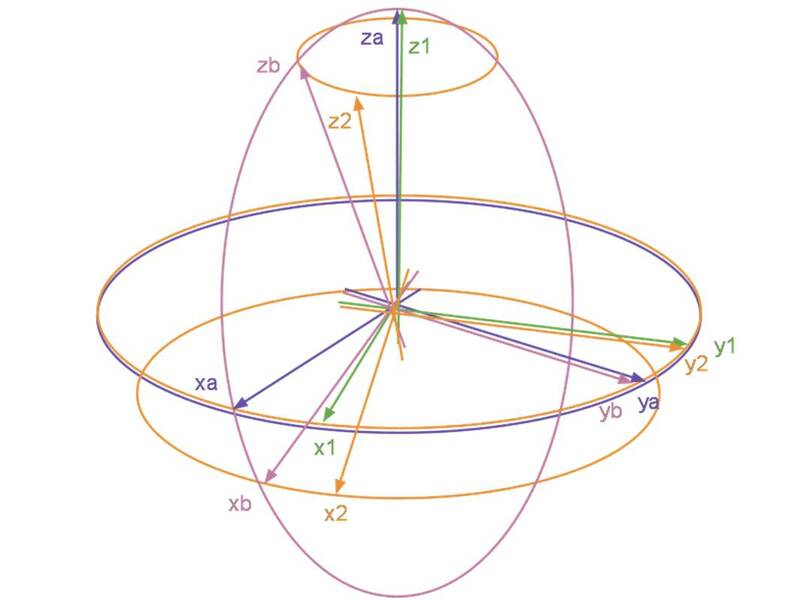 the new axis is notated by 2.
rotate on , the z-axis in the 2-frame by angle , which is . 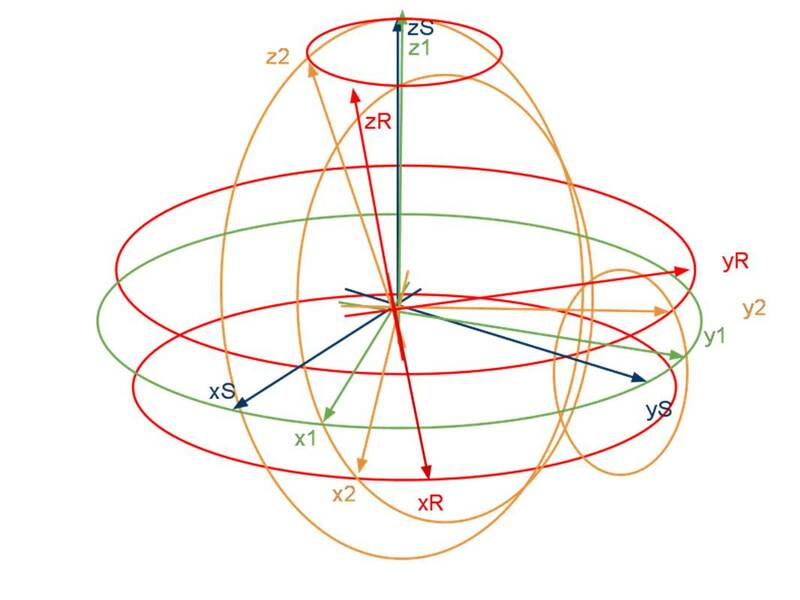 the new axis is notated by R.
for each rotation is on a new frame, the computation will be ugly, since, after each rotation, we have to use the rotation matrix in new coordinate. 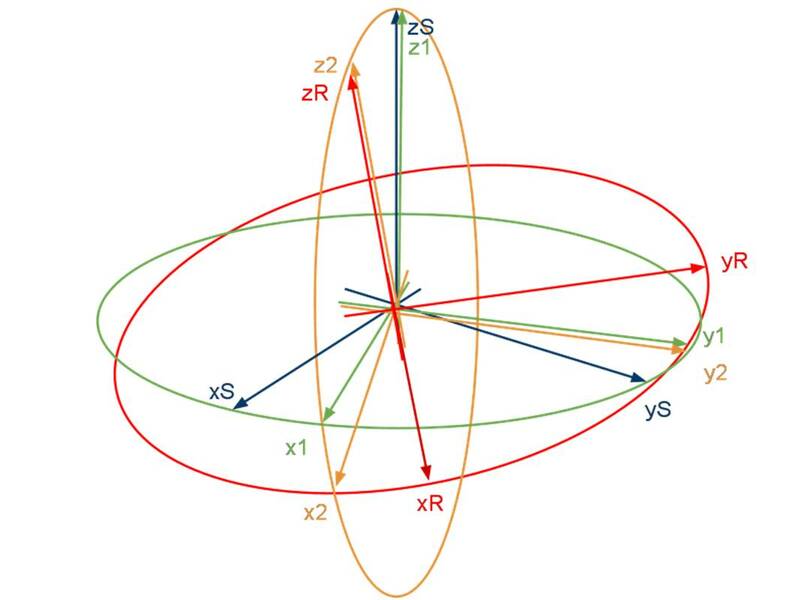 which mean, the rotating on y1 -axis by is equal to rotate it back to on zS -axis and rotated it by on yS – axis, then rotate back the to on zS – axis. i use a and b for the axis between the transform. and we have it for the z2-axis. by using these 2 equation and notice that the z1-axis is equal to zS-axis. which act only on the the same frame.